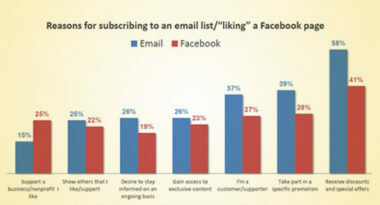 The opportunity to get special offers and promotions is the primary reason that consumers both subscribe to email lists and “like” brands on Facebook, according to the recent “10 Facts About Why and How Consumers ‘Like’ and Subscribe” survey from Constant Contact and Chadwick Martin Bailey. MarketingProfs.com reported on these enlightening marketing findings. The report revealed that discounts drove 58 percent of respondents and special promotions prompted 39 percent to subscribe to a brand’s email list. Less-effective offers included access to exclusive content, staying up-to-date on the brand, and supporting the company. In terms of “liking” a brand, 41 percent of Facebook users were compelled by discounts, followed by 28 percent by special promotions, and 27 percent by their desire to show support for a brand. The study also showed that the two main reasons consumers opt-out of emails or “unlike” a brand on Facebook are the same. Consumers disengage because they believe the content is no longer relevant to them, as well as because they receive too many emails or notifications. These two reasons were deemed more important than having a bad experience or simply no longer supporting the business. These are major findings that brands need to understand in order to maintain and grow both their email subscriber and Facebook fan bases. Another interesting survey discovery was the reason why people open email. Apparently, 64 percent of email users cited the sender’s identity as the most compelling reason, while 47 percent were intrigued by the subject line, and 26 percent were tempted by a special promotion. Finally, while mobile devices have become increasingly popular, 84 percent of respondents primarily accessed their email via computer and 82 percent checked their Facebook pages by the same means. Respondents also used their mobile devices for these purposes, but only about 15 percent made mobile their main mode of online access. To discover the latest ways to use Facebook and email marketing to capture your audience’s attention, contact MDG Advertising today at 561-338-7797, or visit mdgadvertising.com.